Within Teamwork Desk, your invoice details are taken from your Teamwork Projects owner company details. To update your Desk invoice details you will need to update your Projects owner company details. Note: Only site owners or site administrators can update company information. 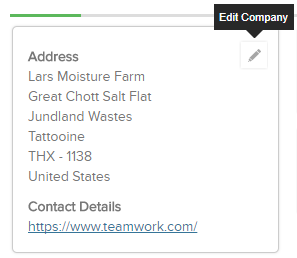 To do this, click the People option to the top of your Teamwork Projects site. Select company to the left of the page. You can then find the owner company from the list. The owner company is indicated by a green "owner" tag to the right of the company name. Click on the company name and you will then have the option to edit the details to the left of the page. Once updated, Desk invoices will reflect your changes to the right of the invoice.